Recently I have been relearning the word effective. This is not the kind of effective that keeps a clean house and dinner at 5pm. It is not being on-time and meeting every deadline. This is the effective that releases tension, embraces one’s own personality and is in the moment. This is choosing to set aside our priorities for the present interest of our loved ones – playing trucks with our child, engaging our friend’s favorite discussion topics, or watching our significant other’s favorite genre movie. On a lighter note, living in summer’s present is eating all of her delicious fresh produce. Crisp is a simple way to enjoy a variety of plentiful fruit. This is a clean-ish version of crisp. 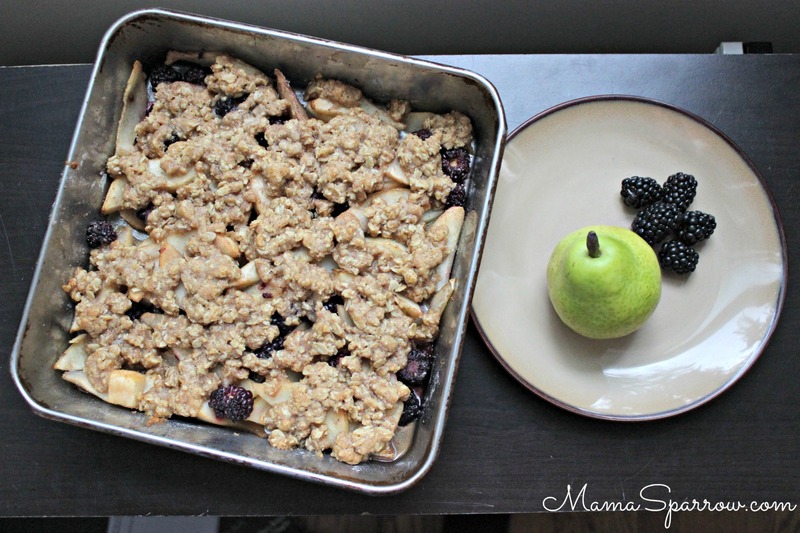 Fresh cut fruit is lightly sweetened with pure maple syrup and topped with a crumbled oatmeal crisp. A hint of spice brings out the fruit flavors. Feel free to swap out the maple syrup with agave or honey, if you like. Preheat the oven to 350F. Peel, core and thinly slice the pears. Half the blackberries. Place the prepared pears and berries in a 2 quart baking dish or 9x9 inch metal pan. Have you ever had one of those kitchen fails that so derailed your day that you shirked all other responsibilities and watched a stupid movie? That happened to me this week. My first batch of coconut cream must have had some residual liquid so it did not whip. I tried to save it by adding a plethora of things – cornstarch, powdered sugar, greek yogurt. It remained a stubbornly liquid cream that was offensively overly sweetened. Dinner was also cooking in the process. Unfortunately the pan of cooked potatoes missed the colander and all went down the sink. To top it off my nap striking toddler was writhing and howling at my feet as all existence had become objectionable to him. A more successful second attempt at dinner and a few deep breaths helped to power through bed time for the little ones. Then we enjoyed a stupid movie and an improvised dessert. Instead of coconut cream, we slathered slabs of sugar cookie crust with honey sweetened yogurt and fresh berries. It was good. If you do not use this recipe with coconut cream, I hope you go with the yogurt topped route. The coconut cream is what makes this fruit pizza really special.The sugar cookie crust is reminiscent of Potbelly’s sugar cookies – chewy and vanilla forward. Top that with honey sweetened coconut cream and fresh berries. 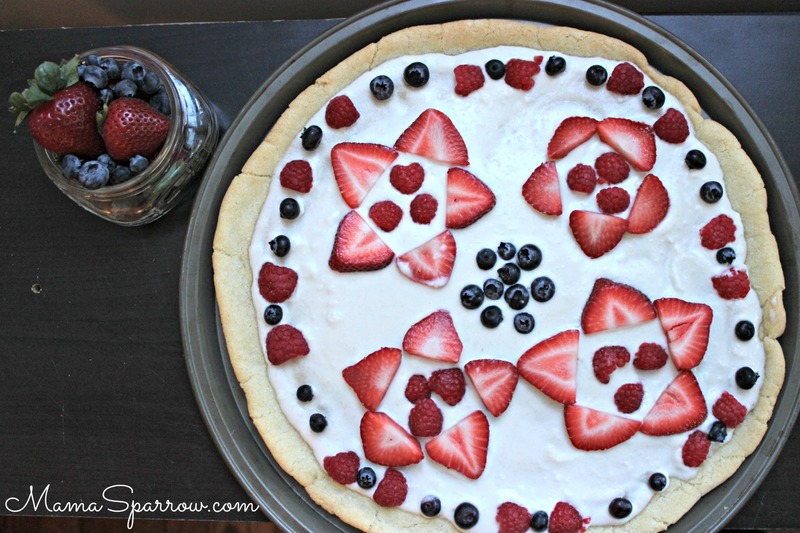 We have a dessert pizza that will please a crowd and is vegan to boot. If you happen to have left overs because you make extra, I won’t judge you for eating it for breakfast. Hope you get an opportunity to make this and enjoy a safe, fun weekend! A Potbelly reminiscent sugar cookie crust topped with whipped coconut cream and fresh berries. Beautiful enough to work for an occasion and tasty enough that the whole crowd will love them. In a medium bowl, whisk the dry ingredients together - flour, baking powder, baking soda, and salt. In a large bowl, cream the sugar into the room temperature coconut oil. Add in the yogurt, vegetable oil, cornstarch, milk and vanilla mixing thoroughly. Add in dry ingredients into the wet ingredients and combine into a dough. If the dough is a little on the dry side add a tiny splash more milk. Form the dough into a disk, cover and refrigerate for at least 1 hour. Roll or press dough out onto a 12 inch pizza pan lined with parchment paper. Bake for 10-14 minutes - just until browning on the edges. Cool cookie completely. Whip the coconut cream in a stand mixer or by hand until it creates peaks. Stir in the honey and vanilla extract. Spread the whipped coconut cream on the cooled cookie. Decorate with berries. *Refrigerate the can of cream overnight. Open can from the bottom side and carefully remove the solids. Save the liquids for a smoothie or other later use.